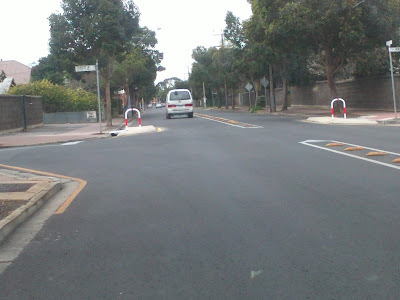 Seem to have take forever but the pedestrian islands have now been completed on Ease Ave. These have been through two rounds of consultation and I hope residents are feeling a little safer when crossing the street. There has been some criticism from cyclists who see them as a squeeze point. There are no cycling lanes on this section of East tce as it is anticipated that cyclists will be on the Mike Turtur or Greenways bike paths if they are travelling into the city. Hope you like them? Surely we don't need cycle strips on every road in the State. I use East Ave to avoid Unley Road. What I'd like to see on Unley Road are pedestrian overpasses, especially at school crossings. Many times a single person stops peak traffic flow along one of the busiest arterial routes. Can't we have safe efficient pedestrian crossings or must foot and cycle traffic win over cars every time? This is the 21st century isn't it or am I still living, like it appears most people in the 20th?